The gym routine is a blessing, but it can have its downsides too. Far too often, people get caught up in the same thought patterns. Thinking “I need to lift every day” or “I need to get cardio in five times a week” are motivational, but they also put us into an unintentional rut. When we start thinking we need to do the same activity every day to be healthy, we’re actually setting ourselves up for failure. As we’ve talked about in the past, balancing our gym workouts is essential for our success and health as a whole. Learn even more about balanced workouts from our fitness center, and visit us to learn more about personal training, group fitness classes, and so much more! What is a balanced workout routine? As Livestrong explains, “Your workout program needs to contain three essential components to be safe, effective and balanced.” Throughout the week, your workouts should cover aerobic, resistance, and flexibility exercises. Aerobic exercise is a necessary type of fitness that concentrates on your heart health. It’s also good for maintaining a healthy weight. Your cardiovascular system depends on aerobic exercise to help strengthen muscles, improve your heart health, and increase blood flow. Aerobic exercise is anything that gets the heart pumping — running, biking, or playing a sport such as soccer or basketball are all examples. Resistance exercise is another word for weight lifting or weight training. It doesn’t just improve your muscle tone, it helps strengthen your bones in the process. Resistance training is a great way to help define your muscles and improve your overall strength. Flexibility exercises are exercises that improve your range of motion. These are the most overlooked, yet most important exercises around. Proper flexibility and stretching techniques can prevent injuries, yet it’s often seen as “not an exercise” because it doesn’t give the same sweat-inducing workout that aerobic or resistance exercises do. In order to have a balanced gym workout, you need to utilize all three of these exercises throughout your week. Think of working out like eating. If you ate a sandwich for every single meal, you’d be getting some essential nutrients, but you would be lacking in many others. Plus, it gets pretty boring eating the same thing every single day! Switching up what we eat keeps us healthy and motivated, and the same goes for working out. Not to mention, a balanced workout helps reduce the chances of sustaining an injury. If you run for 45 minutes every single day, the same muscles are getting the same wear and tear every day. But if you switch off between your types of workouts, you allow certain parts of your body to rest and recover — it’s a more holistic way to strengthen and maintain your body. Why does a balanced workout feel so hard to do? Runners and weightlifters are two examples of people who struggle with switching up their workouts. Running and lifting are both pretty intense activities — you feel the workout as it’s happening. Other activities seem “easy” by comparison, or like they won’t produce the same results that you’re looking for. We keep saying this because it’s true, but if you only do one type of workout every week, you’re putting yourself at risk for injury. And if that happens, you’ll need to spend time recovering, which will mean you can’t do your favorite workouts at all! Trust our fitness center when we say it’s better to balance your workouts now than to sit restlessly on the couch in recovery mode and wish you had. How can I balance my workouts? Aerobic exercise: 3-6 days a week, between 30-45 minutes at a time, and at least one day of rest. Resistance training: 3 days a week that covers all muscle groups, with at least one day of rest in between each workout. Stretching: Stretching should happen before and after your workouts. Stretch major muscle groups and hold each stretch for 15-30 seconds. 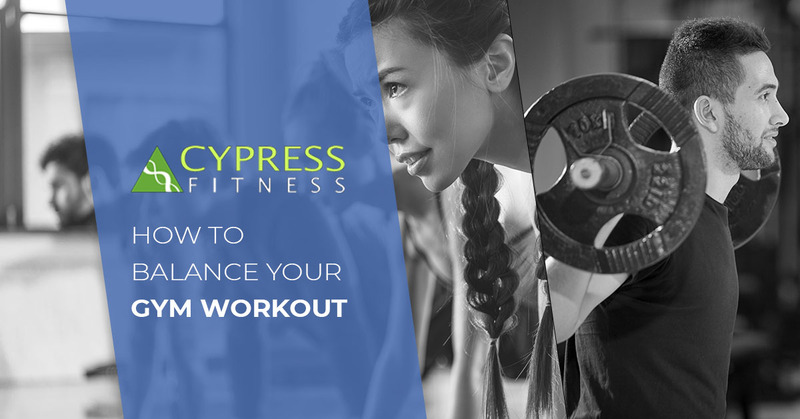 This is an overall guide, but when you work with the personal trainers at Cypress Fitness, we’ll come up with a perfectly balanced gym routine for you to work at. Our fitness center is full of highly trained specialists who know how to help you reach your goals in a safe and successful way. Contact Cypress Fitness to get a tour of our facilities, we look forward to seeing you!